Spring is coming! I am so excited for the warmer afternoons and longer days. The flowers are already showing their cute little heads in the rich brown earth and the buds are almost visible from my window on the trees in my yard. Spring in Maryland is so beautiful. The array of colors is breathtaking. Our recipes today are all about spring flavors and memories. I have had this cookbook, that was given to me by a friend, for a long time. I know it is old because the date on the front is typed: 1976. The entire cook book is typed. The second reason I know it's an older cookbook is because the recipe calls for shortening. I don't use this ingredient very often. I wasn't sure if I should. I went for it anyways. The cookies were quite tasty. The texture soft on the inside with a bit of a crispy edge on the outside. I added a bit more orange juice to balance out the flavors a bit. 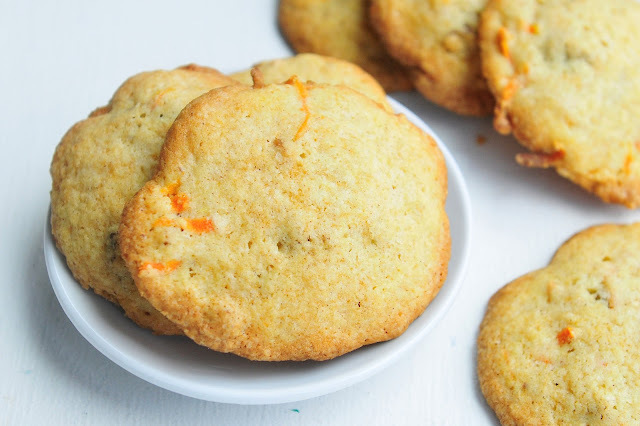 I say the cookie is a carrot cookie but it has a lovely blend of orange and carrot. I hope that you enjoy our recipes for Sunday Supper. All of the links are listed below. NOTE: You can substitute 2 cups of flour for the rice flour, tapioca starch and xantham gum if you don't need them to be gluten free. The cook time will vary too--10 minutes. Cream shortening and sugar, beat in egg and vanilla. Add carrots and orange juice. Combine well. Sift dry ingredients together and combine with wet. Drop by large spoonfuls onto a lined cookie sheet. The cookies do spread so leave 2 inches between each one. Bake at 350 for 15-18 minutes. Remove and transfer to cookie rack. Please be sure you join us on Twitter throughout the day during #SundaySupper. We’ll be meeting up at 7:00 p.m. EST for our weekly #SundaySupper live chat where we’ll talk about our favorite Springtime recipes! What a lovely mixture of flavors, and "soft on the inside and crispy on the edges" sounds perfect to me! Spring cannot get here fast enough! These look very tasty! Love the carrot and orange combination!